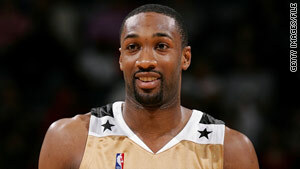 Washington Wizards leading scorer Gilbert Arenas denies claims that he pulled a weapon in the locker room. Washington (CNN) -- Two Washington Wizards basketball players drew guns on each other during a heated Christmas Eve gambling debt dispute, the New York Post reported Friday. Law enforcement authorities said they were investigating an incident but gave no details. Wizards teammates Gilbert Arenas and Javaris Crittenton both brandished firearms in the team's locker room, the Post reported, citing NBA league sources. The dispute erupted when Arenas, a three-time NBA all-star, refused to pay up on a debt owed to Crittenton, the Post stated, citing an anonymous league source. Multiple sources said Arenas drew his gun first, the Post reported. Arenas denied the charge, saying he never pulled a weapon. Neither Arenas, 27, nor Crittenton, 22, could be reached for comment Friday. The incident, according to the Post, occurred during a Wizards practice day at the Verizon Center, the team's arena in downtown Washington. It is unclear whether any other Wizards players witnessed the alleged confrontation, the Post said. NBA spokesman Tim Frank said Friday that there is "an active investigation" being conducted by Washington law enforcement authorities. "We are not taking any independent action at this time," he said. The Wizards also released a statement Friday saying that the team takes "this situation and the ongoing investigation very seriously. We are continuing to cooperate fully with the proper authorities and the NBA." A Washington Metropolitan Police Department statement earlier in the week said local law enforcement was assisting the U.S. Attorney's Office for the District of Columbia "with an investigation into an allegation that weapons were located inside a locker room at the Verizon Center." "There are a lot of rumors going around," Washington Police Chief Cathy Lanier said Friday. "We need to get it right." CNN's David Close and Rick Martin contributed to this report.